25056 at Reddish depot on September 16th 1979. The nineteen year career of D5206/25056 was spent allocated only to London Midland Region depots. Time between withdrawal & scrapping: 31 months. January 1965 to London Midland Midland Lines. December 1967 to Springs Branch (8F). 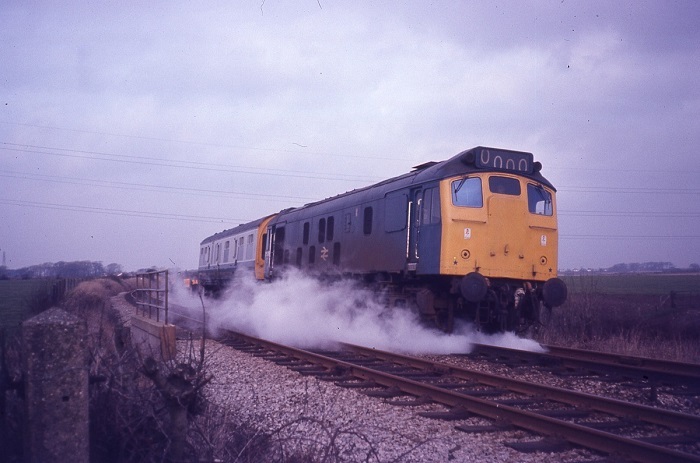 May 1973 to Springs Branch following abolition of the LMR Division allocations. May 1977 to Carlisle Kingmoor. 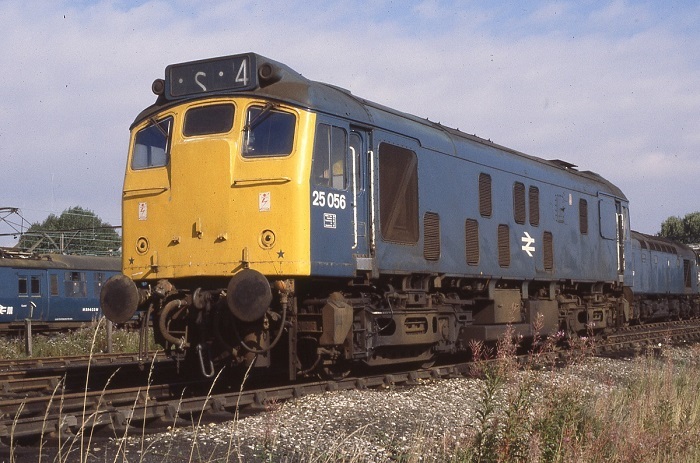 25056 was the 133rd Class 25 withdrawn, one of three retired during August 1982. 25056 is reported as being withdrawn due to sustaining severe wheel flats whilst being moved with the handbrake on. Initially stored at Tinsley, it was moved to Toton on March 3rd 1983. 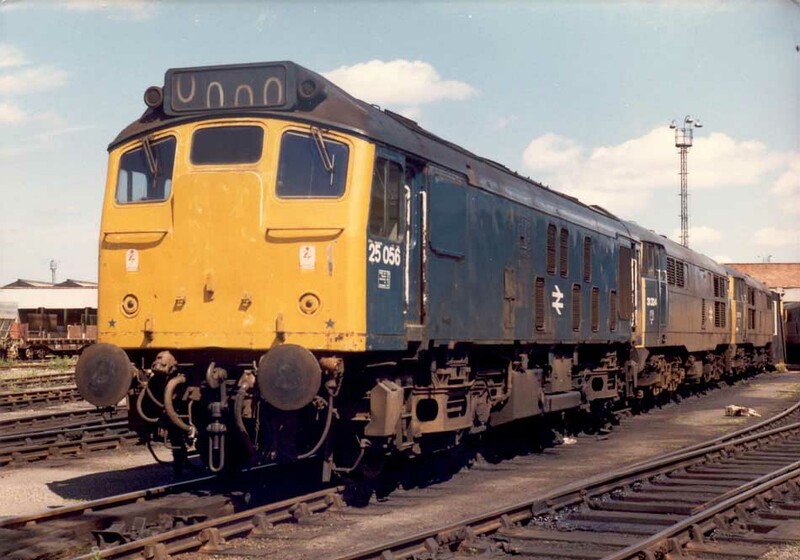 On July 12th 1984 25056 moved to Swindon Cocklebury Yard and entered the Works on July 25th 1984. It had been broken up by the first week of March 1985. Noted Derby Works September 1966. Noted Derby Works February 1976. Noted Derby Works October 1979. The allocation history of D5206/25056 provided the opportunity for a great variety of passenger workings. Perhaps the first of these was the use of D5206 on a Leicester - Eastbourne day excursion on August 11th, the locomotive presumed to work throughout. Condition no month: green livery with small yellow warning panels, curved upper corners, warning panel covers frame level stripe, three rung bogie mounted footsteps. Christmas Eve travellers had the delights of D5206 & D5220 on a relief Derby - St Pancras service. On May 30th the 12.06 Bradford Foster Square - St. Pancras was noted between Leeds & Sheffield behind D5206 with five coaches. On March 4th (or 14th?) 5206 worked 1F51 21.25 Preston - Liverpool Exchange. On March 8th 5206 worked 1P08 09.00 Liverpool Exchange - Glasgow to Preston. On July 20th 5206 worked the 1P08 Liverpool Exchange to Glasgow as far as Preston. The following day (21st) 5206 was noted light engine through Rufford station. On August 4th the Chairman of the British Railways Board made a journey from Manchester to St Pancras via Birmingham & Derby utilising saloon DM395707 hauled by 5206. Photograph courtesy Tom Sutch. An interesting detailed side portrait of 25056 at Springs Branch on June 15th 1973, showing the standard blue/yellow livery as applied by Derby Works. Photograph courtesy Tom Sutch. 5206 at Springs Branch June 15th 1973. 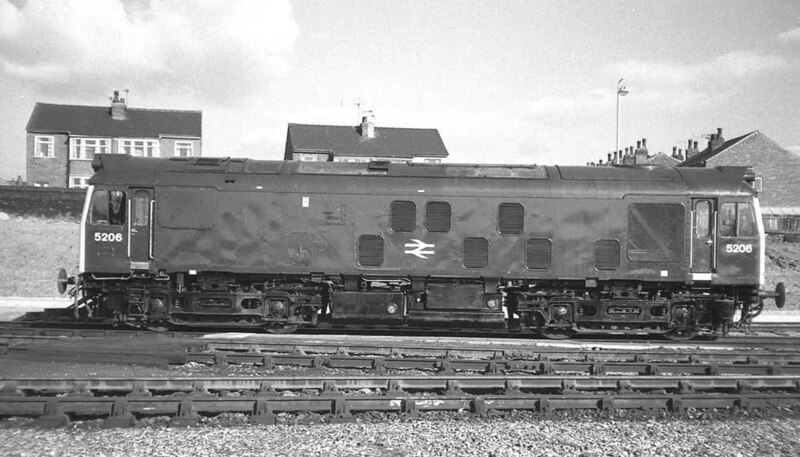 June 1974 - still fitted with cab front gangway doors. On August 17th 25056 & 25049 worked the 09.19 Manchester Piccadilly - Yarmouth to Lincoln Central, returning from there with the 09.15 Yarmouth - Manchester Piccadilly. During January 25056 was transferred to Longsight. On March 31st 25056 worked a Manchester Victoria - Llandudno Town service and possibly a service from Llandudno Town to Llandudno Junction and further?? The 09.00 Llandudno Town - York was worked by 25056 on June 21st. On September 9th the 08.55 Manchester Victoria - Llandudno Town and 12.30 Llandudno Town - Manchester Victoria were worked by 25056. On March 11th 25056 worked the 22.50 Shrewsbury - York as far as Crewe. Photograph collection of webmaster. A steaming track inspection special has stopped at Mosside on the Kirkham - Blackpool South branch on a cloudy, overcast March 2nd 1978. On May 13th 25056 worked the 10.15 Birmingham New Street - Norwich throughout, a total of 174 passenger miles. The 17.10 Cardiff - Crewe was worked by 25056 on June 27th. 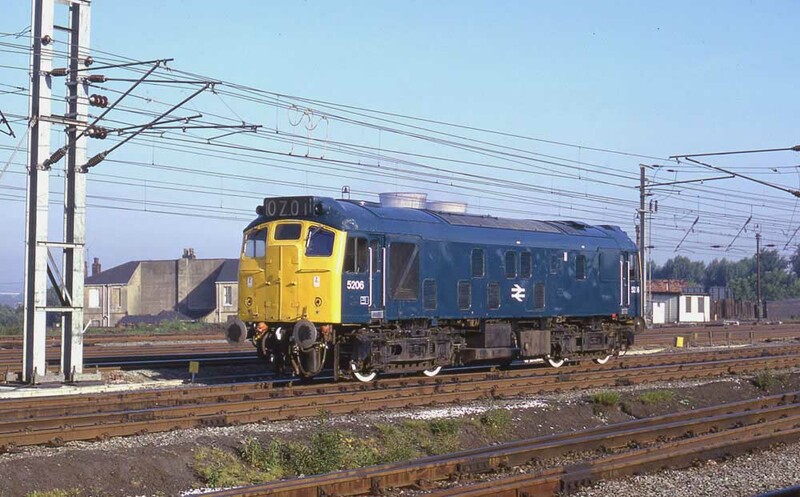 On July 28th 25056 & 25041 worked the 18.05 Blackpool North - Stranraer Harbour forward from Carlisle, returning the next day (29th) with the 01.20 Stranraer Harbour - Blackpool North to Carlisle, a total of 332 passenger miles for these two days. On January 8th (or possibly February 7th?) the 15.07 Plymouth - Manchester Piccadilly was worked from Gloucester to Birmingham New Street by 25056. Photograph courtesy Graham Turner. 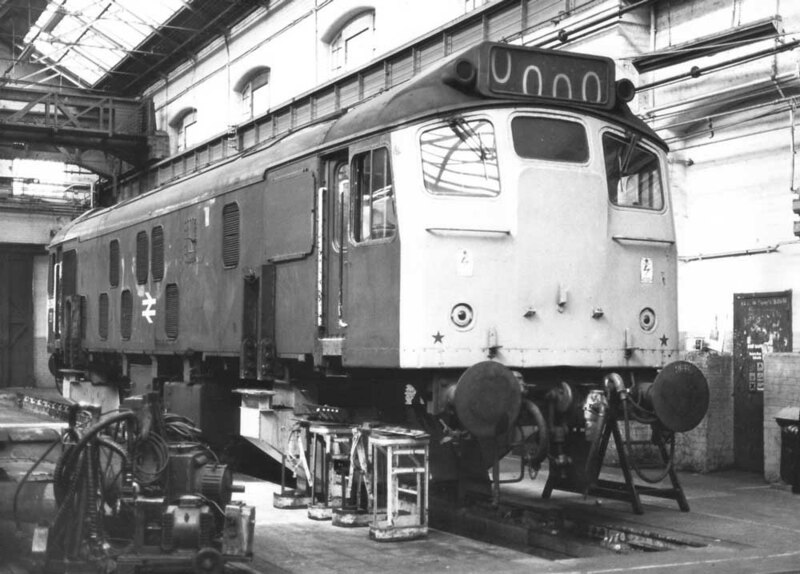 A fine view of 25056 receiving attention at Derby Works on October 7th 1979. This was possibly the last visit to Derby Works for 25056. 25094 & 25056 worked to Hither Green with October 16th’s 11.45 ex-Brent returning with the 10.57 Shepherdswell – Cricklewood. A diesel multiple unit worked Stranraer Harbour - Glasgow Central service failed at Dunragit on November 3rd, 25056 dragged the service to Glasgow. The Thompson B1 Locomotive Society 'Gricers Heaven' railtour on November 24th was worked by 25056 & 25070 between Ashburys & Preston. The second half of August saw 25056 very active on the North Wales mainline with a variety of local passenger services. On August 16th 25056 worked the 14.40 Manchester Victoria - Llandudno Town and the 18.17 Llandudno Town - Manchester Victoria. From August 19th four active days commenced, working the 19th's 13.40 Manchester Victoria - Llandudno Town, 16.42 Llandudno Town - Crewe and the 20.30 Crewe - Bangor. On August 20th 25056 worked the 09.42 Llandudno Town - Manchester Victoria. August 21st produced the same workings as the 19th, but started with the 09.42 Llandudno Town - Manchester Victoria, making for a very full day with a total of 324 passenger miles. On August 21st & 22nd 25056 worked the 20.30 Crewe Bangor Crewe - Bangor, on the 22nd it followed this with the 22.45 Bangor - Llandudno Junction. On August 28th 25056 handled the same four workings as of August 21st, whilst on August 28th 25056 worked the 13.40 Manchester Victoria - Llandudno Town and the 16.42 Llandudno Town - Crewe. The 07.38 Barrow - Liverpool was worked by 25056 on November 10th. 1981 produced a good number of passenger workings with considerable variety. During March 25056 was recorded multiple times on the Crewe - Cardiff services. On March 2nd it worked the 12.25 Crewe - Cardiff and the 17.10 Cardiff - Crewe. On March 27th it worked the 15.10 Cardiff - Crewe, whilst the next day (28th) it worked the 07.50 Cardiff - Crewe. On May 16th a Newcastle - Bridgnorth day excursion saw 25056 & 25130 work the roundtrip Birmingham New Street - Bewdley portion of the excursion. A week later on May 23rd 25056 & 25271 worked the 10.10 Euston - Aberystwyth forward from Birmingham New Street, returning with the 18.00 (or 16.10?) Aberystwyth - Wolverhampton. Photograph courtesy Jerry Glover. 25056, 31324 & 31178 catch the sun at Thornaby on June 14th 1981. This was the last full summer of operation for 25056, it would be withdrawn from Kingmoor during August 1982. The 09.13 Preston - Blackpool North on June 27th failed before departure with 40036, this was replaced by 25056, which also worked the 14.30 Blackpool North - Edinburgh to Preston. On July 4th 25056 worked the 09.42 Manchester Victoria - Bangor. Three days later (7th) 25056 was noted southbound at Doncaster hauling a new Class 313 electric multiple unit. On July 29th a Derby - Aberystwyth day excursion was worked by 25056 & 25270 as far as Wolverhampton and handling the entire return journey. On August 1st 25056 & 25270 worked the Derby - Norwich (for Yarmouth) - Norwich - Derby diagram. Two weeks later on August 15th 25056 & 25073 worked the 07.40 Euston - Aberystwyth forward from Wolverhampton, returning with the 16.05 Aberystwyth - Wolverhampton. At the end of the month 25056 was north of the border on the Glasgow Central - Carlisle service. On August 25th it worked the 12.40 Glasgow Central - Carlisle, August 26th the 08.40 Carlisle - Glasgow Central and the 12.40 Glasgow Central - Carlisle, August 28th the 08.40 Carlisle - Glasgow Central and the 12.40 Glasgow Central - Carlisle and on August 31st & September 1st the 12.40 Glasgow Central - Carlisle, for an eight day passenger mileage of at least 805 miles, possibly considerably more. On September 11th 25056 was noted at Oxford with a mixed freight of about a dozen vehicles. The LVRC 'Tubular Belle 2' railtour on October 3rd was worked roundtrip Llandudno Junction & Blaenau Ffestiniog and Llandudno Town - Llandudno Junction by 25056 & 40057. On December 29th the Southport - Bewdley 'Severnsider' railtour was worked by 25056 & 25219 as part of the outward leg: Manchester Victoria - Ashton Moss - Stockport - Crewe - Stafford - Bushbury Junction - Perry Bar North Junction- Soho South Junction - Birmingham New Street. 25051 & 25058 worked the Birmingham New Street - Bewdley round trip. The return leg was worked Birmingham New Street - Crewe - Southport. On the approach to Crewe 25056 suffered a brake problem bringing the train to a halt short of the station, the train reached the station being driven by 25219, fitters were able to rectify the brake fault affecting 25056. By this time the train was over an hour late, due to this and other problems affecting the railtour throughout the day. 25056 was noted eastbound through Manchester Victoria with an eight vehicle parcels train on January 5th. The 'Peak Forest Peak' railtour on March 6th 1982 was worked between Liverpool - Wigan - Dee Marsh Junction by 25056 & 25086. For some period during the ASLEF strike (July 4th - 18th) 25056 was stabled at Severn Tunnel Junction. 25056 was withdrawn on August 1st 1982. Page added August 25th 2012.